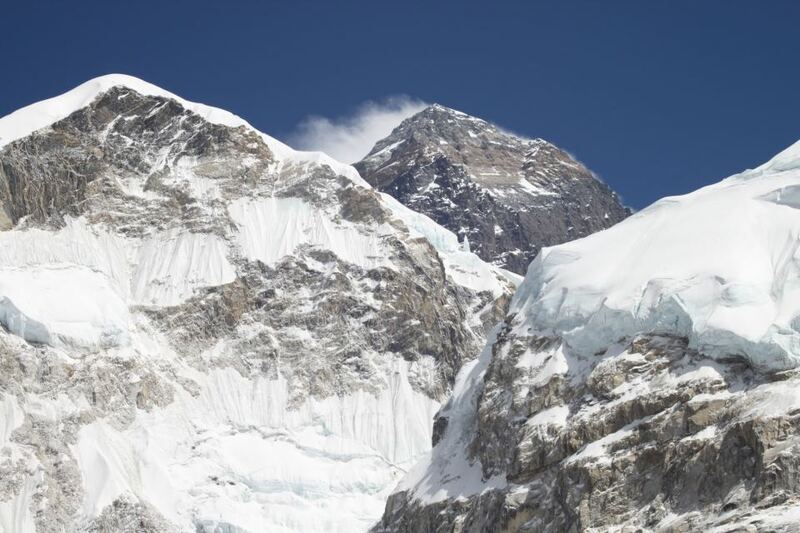 Everest High Passes trek is a superb trek in Khumbu region that takes you through the three of the world famous and demanding passes Kongma La (5535m/18155ft), Cho La (5420m/17778ft) and Renjo La (5345m/17530ft) along with classical route to make complete high-level circuit. 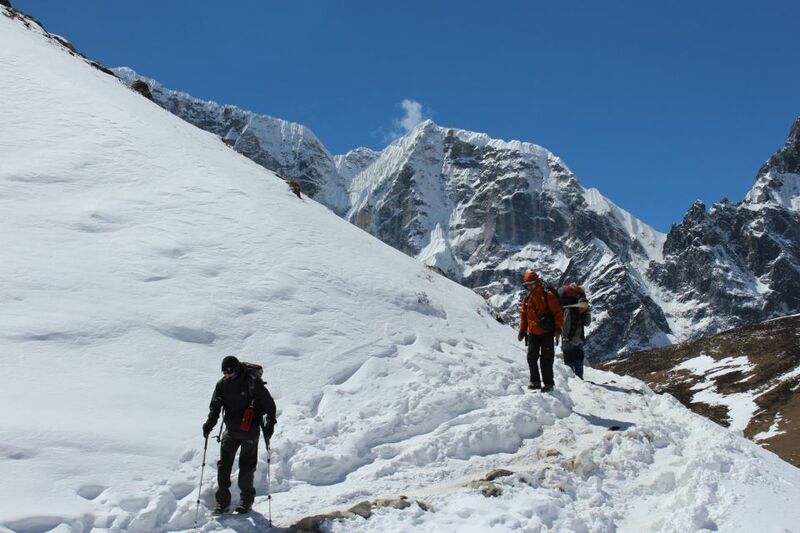 Thus, the Three Passes Trekking is an ultimate adventure in Everest region for true adventurers. This high altitude trek obviously provides the opportunity to visit the Everest Base Camp (5360m/17580ft), Kalapattar (5545m/18188ft), Gokyo (4750m/15580ft) and its serene Lakes, Gokyo Ri (5320m/17450ft), the remote and untouched Nangpa La Valley, the Thame monastery as well through other major remote Sherpa villages and beautiful valleys. Cho La (Pass) has lately become a commonly used pass, but Kongma La and Renjo La are less visited passes. Renjo La pass is much majestic than other passes as you can shoot pictures of north and south ridge of Mt. Everest from the top. This is one of Nepals most famous treks, set amongst breathtaking high mountain scenery. Crossing three spectacular high passes between 5345m/17530ft and 5535m/18155ft makes this trek both challenging and rewarding. The Everest region is certainly the worlds finest high mountain zone. Magnificent landscapes, imposing and prestigious peaks, tapering ridges and colorful villages contribute to turning this trek into an unforgettable experience. The route takes you through the high Khumbu Mountains, Sherpa country, beautiful monasteries, turquoise lakes and much more. The Everest High Passes Trek is guaranteed to quench the wanderlust of even the most intrepid adventurer. Thus, one can imagine the difficulty level of Everest high passes trek, so this is not for the beginner, but will appeal to those who are fit and have previously trekked at altitude. Day 01Arrival in Tribhuvan International Airport, Kathmandu/ Pick up from the airport and transfer to the Hotel The trek/tour guide or/and our airport representative holding AUTHENTIC ADVENTURES sign-board and group name-list will greet you at the Tribhuvan International Airport, Kathmandu and transfer you to the Hotel on our private vehicle which takes about 20 minutes from the airport. After refreshments, s/he will take you to our office based in downtown Thamel for some welcome drinks, paper works and introduction with the crew. The leader/guide will brief about the trip/ trek. Day 02Kathmandu valley sightseeing and Trekking preparation Today, we will visit three spots in Kathmandu valley of historical, cultural and religious importance which are also the UNESCO Wolrd Heritage Sites. We first visit Kathmandu Durbar Square, and observe old palaces, beautiful temples and have a quick glimpse of the Living Goddess “Kumari.” After exploring the historical, religious and cultural center on Kathmandu we will take short drive of about 20 minutes to the Swoyambhunath Stupa, which is popularly known as the Monkey’s Temple as many hundreds of monkeys hang around the temple and amuse the visitors. Monkey’s Temple is situated atop a hill which is believed to have self-existed and its hill top location provides great view down the city and also the Himalayas in a clear day. Then, we drive to another ancient town of Patan and explore its people and their art, culture, tradition and lifestyle. Observing beautifully decorated age old temples and monasteries, we may also have a chance to have a personal audience with the Patan Kumari (Living Goddess). Patan is famous for its temples, fine arts, metal works, stone & wood carvings. We can witness local artists working on their workshops. Patan used to be separate kingdom from Kathmandu and Bhaktapur and different kings ruled this ancient city until the 17th century. There has been little damages at the above sites by the recent earthquake but still beautiful and definitely worth a visit. The renovation is going on most of these sites. Day 03Fly to Lukla (2800m/9184ft) and Trek to Phakding (2610m/8561ft) 35 minutes flight/ 3-4 hours trek Quite early in the morning we drive to the Airport for the 35 minute scenic flight to Lukla. 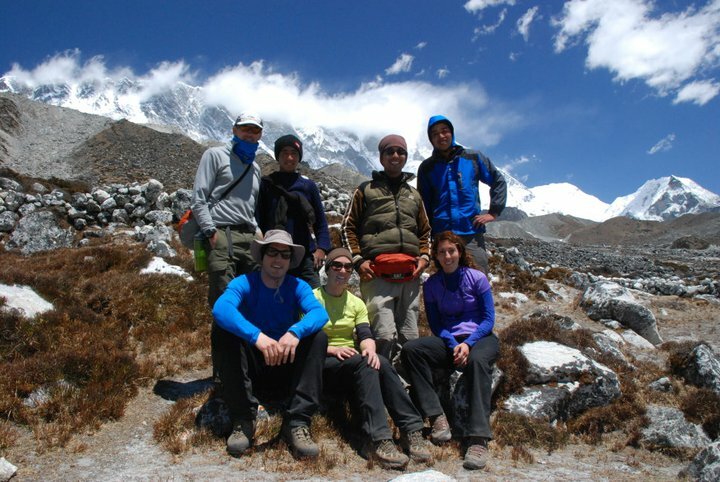 Upon arriving at Lukla, we meet our crew members and begin packing and arranging with them. The mountainous landscape becomes quite prominent and the air carries a crisp freshness. From Lukla, the trekking trail slowly moves towards the Cheplung Village. From there, a gradual walk downwards leads to the village of Phakding. The terrain is amazing and offers fascinating views including Khumbila and Kusum Kangaru. The village of Phakding lies in the Dudh Koshi valley north of Lukla which has a bunch of lodges, restaurants and colorful shops. Day 04Phakding to Namche Bazaar (3440m/11283ft) 5-6 hours We continue trekking along the Dudh Kosi, crossing the majestic river a few times on thrilling suspension bridges decorated with colorful prayer flags. After entering the Sagamartha National Park, the trail climbs steeply with breathtaking views. Namche Bazaar is the Gateway to Everest with interesting shops, lodges, bars and bakeries. Day 05Acclimatization Day in Namche Bazar/ Day Hike We spend an extra night in Namche Bazaar in order to acclimatize. Today, we trek a short distance to the National Park Visitor's Center located atop the town with breathtaking views to the mountains and down the valley. After that we hike up to the Everest View Hotel, one of the highest-placed hotels in the world with oxygenated rooms. From this point, we can see rewarding views of the Himalayas including the almighty Mount Everest. Day 06Namche Bazar to Tengboche (3870m/12694ft) 5-6 hours The trek continues along the Dudh Kosi valley with a long descent to the Dudh-Koshi River with magnificent mountain views. After crossing a suspension bridge, we ascent through the pine and rhododendron forests to Tengboche. After refreshments, the group will be taken to observe an evening prayer ceremony inside the monastery. The Tengboche monastery if the biggest and famous monastery in the Everest region which is decorated with ornate wall hangings, 20-foot sculpture of Buddha, Buddhist religious scripts, musical instruments and robes of the Lamas. Day 07Tengboche to Dingboche (4360m/14301ft) 4-5 hours We descent to Devuche through forests of birch, conifers and rhododendrons. Todays trek also reward us with amazing views of the high mountains. The picturesque trail crosses the Imja River and takes us to Pangboche. We trek towards the Imja Valley crossing the Lobuche River and climbing to Dingboche. In Dingboche, we see beautiful array of fields enclosed by stone walls to protect barley, buckwheat and potatoes from the cold winds and grazing animals. Day 08Acclimatization Day in Dingboche/ Day Hike To acclimatize ourselves well before heading to the Everest base Camp we take an another acclimatization day in Dingboche. 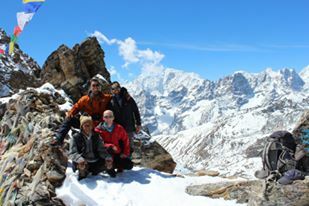 We take day hikes to either Nangkarstang peak or Chukkhung Valley depending on the interest of the group members. The mountain views from both the hikes are spectacular. Day 09Dingboche to Chhukung (4750m/15580ft) 3-4 hoursOur trail passes through stone-walled fields and Imja Khola valley before entering glacier moraines amidst towering Himalayas. The trail continues to Bibre which is a yak herdsman place. From here, directly across the valley is the fantastic Ama Dablam and the Amphu Labsa mountains. The trail ahead is intersected by icy streams. We continue our walk for around an hour and reach Chhukung. Day 10Chhukung to Lobuche (4940m/16210ft) via Kongma La (5535m/18159ft) 7-9 hours We begin today’s trek very early in the morning to reach the highest part of the entire trip which is Kongma La. We can either take a trail over a hill which is to the northwest of Chhukung over the Nuptse Glacier moraines or we can walk back to Bibre and trek on the trail above the Niyang Khola depending on trail condition. The top of the pass is marked by cairns and Buddhist prayer flags. The final descent from the pass is the most difficult part of today’s journey. After climbing the moraine on the far side, the trail turns north through Khumbu Glacier which takes us to Lobuche. Day 11Lobuche to Gorakshep then to Everest Base Camp (5360m/17581ft) and back to Gorakshep (5160m/16925ft) 7-9 hours The hike to the Everest Base Camp is strenuous due to rocky trail and high altitude. 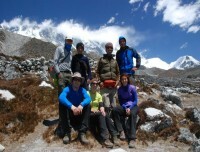 We hike through rocky dunes and moraine to the Everest Base Camp. Nuptse, Khumbuste and Pumori are the mountains we can view from the base camp. We get back to Gorak Shep for a good night's rest. Some breathing problems may arise today due to the altitude. In such case, do not hesitate to report immediately to your leader/guide and he will take appropriate action. Day 12Hike to Kalapattar (5545m/18188ft) then back to Gorekshep and trek down to Lobuche (4930m/16170ft) 5-6 hours We prepare for an early morning departure, amid pre-dawn darkness and cold temperatures. Be prepared for chilly winds which are quite common. This will be one of the most difficult yet rewarding days of the trek. Familiar peaks such as Lingtren, Khumbutse, and Changtse tower to the east as Everest begins to reveal itself. The ascent is demanding but we get the most magnificent mountain panorama: Everest, the highest peak on earth towers straight ahead and on all sides loom the giants such as Nuptse, Pumori, Chagatse, Lhotse and countless others. We make a quick descent to Gorak Shep and have hot breakfast, and then trek down to Lobuche. Day 13Lobuche to Dzongla (4830m/15842ft) 2-3 hours Today's destination is the village of Dzongla, which is actually at a lower elevation than Lobuche. Heading south out of Lobuche we follow the EBC track until it forks approaching the top of Thukla Pass. We take the right fork and follow the ridge. The well-defined trail curves west and offers awesome views of Cholatse (6335m/20779ft) and Taboche (6367m/20884ft). The trail is up and down and ends up descending quite a bit before eventually beginning a climb up to Dzongla. Day 14Dzongla to Thangnag (4700m/15416ft) over Cho La (5420m/17778ft) 7-9 hours This could be the most challenging day of the trek as you go over the Cho La (pass). Fortunately, having already visited Everest Base Camp you should be well acclimatized and getting used to the high altitude. If there is a lot of snow the pass can be difficult. Microspikes can be very helpful if there's lots of snow. It's a tough climb to the top but the splendid views are more than worth it. Day 15Thangnag to Gokyo (4750m/15580ft) 2-3 hours We continue down into the Gokyo Valley and cross the Ngozumpa glacier the longer glacier in this part of the Himalayas and an impressive sight. We should reach Gokyo by lunch. After lunch you should have time to walk up to one of the lakes in the valley and get some great views of the surrounding peaks. Day 16Climb Gokyo Ri (5357m/17570 ft) then day hike to the Fourth Lake 7-8 hours We will hike to Gokyo Ri in the morning and enjoy the breathtaking views of the entire Khumbu region. As we ascend, the views become even more fantastic and we can see four of the seven highest peaks of Nepal, Cho Oyu, Everest, Lhotse and Makalu. Later today, we hike to the fourth lake, Thonak Tsho. We take pleasure in the lake’s serene beauty after which we trek back along the retracing trail to the third lake. We may take an additional hike up to the fifth lake, Ngozumba Tsho if time permits and depending on our physical conditions. From here, the view of Ngozumba glacier, the longest glacier of the Himalayas, is so fascinating. Day 17Gokyo to Marlung (4210m/13810ft) via Renjo La (5360m/17585ft) 7 - 8 hours We start the day early in the morning to complete the long day’s trek over the Renjo La (Pass). Our trail moves alongside the Gokyo Lake for a while. We walk for around two hours before ascending towards the Renjo La. On the way we are rewarded with extravagant views of the surrounding Himalayas. Views from the Renjo La are much like that from Gokyo Ri with the third Gokyo Lake and Gokyo Village beneath the gray smear of the Ngozumpa Glacier. We also get outstanding views of Mt. Everest from the top of the pass. Continuing on from the pass, our trail winds down a stone staircase and then moves over a loose scree to reach the south bank of Angladhumba Tsho (Lake). The presence of ice on the trail while descending down can make our descent a bit hazardous. Along the way we see Relama Tsho and Renjo Lake. We walk down a narrow valley clogged with giant boulders to Lungden where there is a basic lodge, but we continue our walk for an hour to Marlung on the east bank of the Bhote Koshi River. Day 18Marlung to Thame (3800m/13464ft) 3-4 hours The descent from Marulung to Thame follows a traditional route used for centuries by the Tibetan traders. We cross the Bhote Koshi River and descend to Taranga. The trail continues to descend and we cross two bridges before reaching Thame. Overlooking Thame is its famous Gompa situated on a hill to the west. This is the site for the spring celebration of the Mani Rimdu festival, held about the middle of May each year. Day 19Thame to Namche Bazaar (3440m/11283ft) 4-5 hours From here, we descend gradually on a trail that passes through a few small villages before reaching Namche Bazaar which the biggest village in the Everest region. The trek back is very beautiful. We pass through a check post before arriving at the world's loftiest hydroelectric power station, which provides electricity for most of the upper Khumbu region. We pass through gompas, prayer flags, mani walls, and chortens en route to Namche Bazaar. Day 20Namche Bazar to Lukla (2800m/9184ft) 6-7 hours The trail descends steeply downward so we need to walk cautiously as our shaky legs continuously battle the rocky terrain. After crossing the suspension bridges over the fast flowing Dudh Koshi and its tributaries, the trail becomes more level and natural. After our arrival in Lukla, we stretch those sore legs and recall the experiences of the last couple of weeks. In the evening, have a few celebratory drinks and dance with your trek mates. Day 21Fly back to Kathmandu (1335m/4379ft) 35 minutes flight We catch an early morning flight to Kathmandu after our long mountain journey. After reaching Kathmandu, we can take a rest or do some souvenir shopping. If we want to explore any other areas of Kathmandu, we may do that today. Our guides can help you with both souvenir shopping or sightseeing. There will be a farewell dinner with Nepalese cultural program in the evening to celebrate the successful completion of our journey. Day 22Drop to the airport for farewell and departure or extend the trip with other activities Your adventure in Nepal comes to an end today! A representative from Authentic Adventures will drive you to the airport approximately 3 hours before your outbound flight. On your way home you'll have plenty of time to plan your next adventure in the wonderful country of Nepal. However, If you have more time in Nepal and are interested in extending the trip with us, there are many options such as trekking to other regions, jungle safari, river rafting, sightseeing tour, mountain biking, adrenaline activities etc.